I am very late to the party with this one, especially since I already have David Mitchell’s latest book, The Bone Clocks on the TBR since last year and anyone who is anyone has already reviewed that one too, so I’ll try to keep this review brief. But I do want to convince you to beg, borrow or steal a copy if you haven’t got one, because it is such a splendid novel, (as is everything else this author has written). I will start by warning you that, enjoyable as the early chapters are, they are deceptive. Even an alert reader may be lulled into thinking that this is a story of a junior clerk called Jacob de Zoet, up against corruption in the trading post where in 1799 he works for the Dutch East India Company, a tale spiced up with the claims of two women on his heart, one of them Japanese and the other at home in Holland. Such a story is interesting, it will engage your attention, (and it will stop you doing the housework) … but it is just a taster for a heart-stopping tale that becomes more enthralling with every page you turn. There are three characters whose lives are defined by a thirst for knowledge. Jacob falls on his feet when he’s abandoned on the doorstep of a bluestocking. Orito is fired by a passion to build bridges over the ignorance of her countrymen, and Dr Marinus wants to be the first European to describe the botany of Japan. But Japan in this era is a closed society, where to bring a Christian psalter into the country is to invite grave punishment, where they do not even know that Europe’s discovery of the printing press and the rifle is about to impact on the East, and where by the 1850s the gunboat diplomacy of the Americans was to prevail because the Shoguns had no power to withstand it. There are spies everywhere, watching every move the Dutchmen make and reporting back to their Japanese masters. But the lesser characters are equally compelling. Among the Dutch merchants and traders, all are out to make money, occasionally through promotion but more often through graft and corruption, to make up for the long years spent away from home. (And sometimes for having been press-ganged into service in the first place). Among the Japanese, there is the enigmatic Ogawa who unbeknownst to Jacob is a rival for Orito’s heart, there is Enomoto, a powerful man angered unwisely by Jacob who won’t grant his desire to have a monopoly on mercury, and there is Shuzai, a man more cunning than he seems at first. The bluff arrogance of the Dutch contrasts with the wily courtesies of the Japanese, but there is deception and betrayal on all sides. (There’s another …um… group that comes in for critique, but I’m not going to spoil the surprise by naming them, though if you know your history you can probably guess). Mitchell also explores faith and belief in this novel, and what people will do because of it. The Japanese fear the Christian faith so much that they will not allow any practice of it on their soil. Their belief in their own superiority closes their minds to any foreign ideas, and that includes religion. But Jacob will not part with his strictly forbidden psalter not just because he is a pious man who uses it to pray, but also because it deflected a musket ball from his grandfather’s heart when he was serving in Palestine. It’s not exactly a talisman against danger, because Jacob is not a superstitious man, but it has saved the lives of two of his ancestors and he values it as a family heirloom too. Holding on to the psalter, however, doesn’t just put Jacob at risk, it also endangers the inspector who failed to confiscate it, and Jacob feels guilty about that. Guilt, who feels it and why, is another powerful theme in this book. But this is nothing compared to the consequences of another man’s beliefs about immortality. One of the aspects of this novel that I really liked is Mitchell’s narrative technique. Every word spoken between the Dutch and the Japanese on the tiny island of Dejima, takes place in two languages. While the reader sees the point of view of multiple characters, what we read first is the perspective of the Western characters, and then the struggles of the Japanese translators to render it intelligible to their masters. Graded according to their skill, they confer with each other, and sometimes gain the assistance of one of the Dutchmen, (usually Jacob). Marinus peers through the lamp-lit smoke. Uzaemon wonders whether his discourses are prepared in advance or netted from the thick air extemporaneously. ‘Microscopes and telescopes are begat by Science; their use, by Man and, where permitted, by Woman, begets further Science, and Creation’s mysteries are unfolded in modes once undreamt of. In this manner Science broadens, deepens and disseminates itself – and via its invention of printing, its spores and seeds may germinate even within this Cloistered Empire. This is so cleverly done, enabling the reader to visualise from all sides these scenes where East meets West: the interlopers, impatient with what they think is superstition and ignorance; the interpreters, learning as they go; and the rulers of the island, alert for any information that questions their authority or power. Personal copy, purchased from Benn’s Books Bentleigh. Yes, I read it awhile back – and it makes me think about Amitov Ghosh’s Sea of Poppies (1st in the Ibis Trilogy) which takes place in about 1835-39, only 35 or so years after Jacob’s fictional adventures, 1799, and not all that far away. getting backed up on my reading! Yes, I’m enjoying the way these two authors have dealt with this tumultuous period in their different ways. It’s made me think that sometimes (as Tolstoy said about war) that it’s not possible for the people who are there to know what’s going on because they don’t have – can’t have – the big picture. 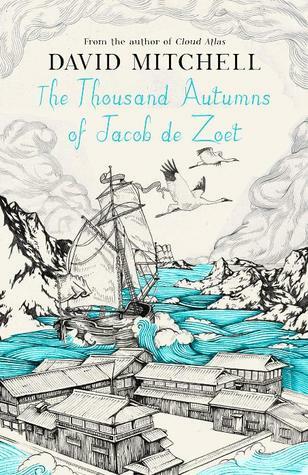 It takes a postcolonial eye to write the Ibis Trilogy or The Thousand Autumns…. I really enjoyed your review, Lisa. I loved the dynamics between the characters in this novel. It’s my favourite of Mitchell’s books – I just didn’t want it to end. Thanks, Jacqui. I liked this a lot, but I loved Cloud Atlas a little bit more partly because of its audacity and partly because I loved circumnavigating it – it was the journey, the adventure of reading it that I liked so much. Thanks for the reminder to read this… I’ve had it on my pile ever since it came out in hardcover; it was a freebie with a magazine subscription I took out. You’ve convinced me I should try it; I wouldn’t call myself a Mitchell fan, as I thought Cloud Atlas was over-rated, but I did very much enjoy Black Swan Green. Oh good, I’m not the only one to leave it so long to read it! Better get busy, (lol) – Mitchell’s got a new one out this fall – it’s called “Shadow House,” release date October something. I haven’t read it either, even though I’ve meant to for ages. Great review by the way. Just like your Flood of Fire review, now I have a better idea on what the book is about. Thank you:) I think this one would be a good one to start with. Cloud Atlas was challenging, there’s no doubt about that, and you have to be in the mood for writing that’s intentionally designed to make you work hard at it. … I mean, when I read CA, and found myself not knowing what was going on, I got out my journal and took notes as I went along and eventually things fell into place. (Reading Don deLillo’s Falling Man was the same). But not everyone wants to do that with a book, and you have to have the time to do that, and even when I have the time, I don’t always want to put myself out like that. Different books for different times in our lives, I say…. Ah yes, I read and reviewed this a few years ago. My bookgroup did it, and we had such fun. One member even prepared a spreadsheet to keep track of all the characters. I particularly enjoyed the novel because a couple of years before I read it, we had been to the Dejima site in Nagasaki. (I included a photo of the model of Dejima in my post). Fascinating stuff. LOL, Lisa, it *was* my reading group.We try to keep up with a variety of contemporary works, as well as the occasional classic/older work. I know, but I really hate it when I leave a good book languishing too long. Look what happened with the Simon Mawer books, the sequel came along before I’d read the first one. And now Becky says there’s a new Mitchell coming…. I thought I’d have more time to read in retirement, but I’ve made hardly any impact on the TBR. Haha, Lisa … I did too. But I’ve actually read at pretty much the same rate as before. So busy! Some months I pick up, and then others I fall any behind, evening it all out.